The New Year is a time of both reflection and planning ahead. For businesses, it’s the perfect opportunity to recognize and reconnect with customers and employees as well as celebrate individual milestones and company-wide successes. On the tail end of the holiday season, employees and customers alike will be relaxed and in good spirits. With thoughtful recognition and celebration, business leaders can continue the good cheer into the year ahead. Both employees and customers are critical to a business’ success. Employees should be reviewed (at the very least) at the end of the year or beginning of the New Year to measure their accomplishments against specific, quantifiable business goals, says Entrepreneur. It’s important to recognize specific successes that contributed to the business during the past year in addition to any critiques. The idea is, of course, to use the New Year as a chance to reinforce and strengthen customer relationships. After reflecting on the past year’s successes, take the time to handwrite letters thanking valuable employees and customers for their continued support. With employees and customers still relishing in the spirit of the holidays, this is a great time for businesses to celebrate another successful year of working together with a simple, heartfelt message of appreciation on a business New Year card. Think about how your business needs to grow moving into the future. Do you need to open communication channels, and start communicating more with employees? Did employees lose sight of the past year’s business goals, and do leaders need to reiterate how success is defined? Maybe your business needs to change its recognition routine. Instead of focusing on the past, “give [employees] feedback, advice, and wise counsel about what they can do next time,” Monster advises. Business can also make a resolution to improve customer relationships in the year ahead. Whether improving customer service initiatives or strengthening current relationships, making a change can positively impact business in the coming year. After reflecting, recognizing, and resolving, celebrate the year’s achievements across the organization. 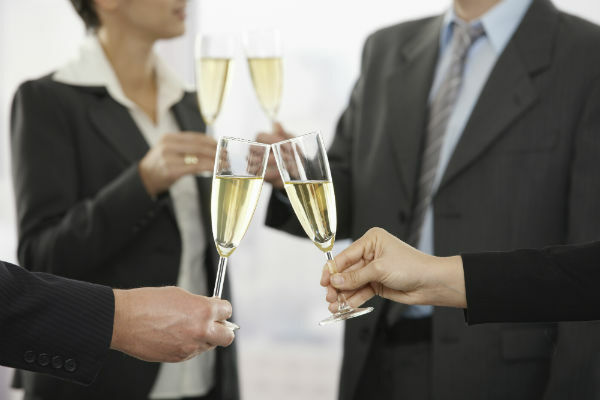 “A cheerful office party at the end of the year sets the tone of the office for the New Year ahead! Sending people off on a festive note before they enjoy time off lets them feel more positive about returning to work. A good attitude will have everyone prepared to face the coming year,” says QC Event Planning. The event company suggests setting the party’s atmosphere with thoughtful decorations that fit the theme. For New Years, gilded dinnerware and sparkling decorations will get people in the celebratory mood. If budget allows, schedule the party around an activity like live entertainment or a comedy show. Including notable customers in the holiday cheer can reinforce the relationships fostered during the year. “A holiday event gives your business an opportunity to create intimacy and reserve a moment with your customers. When you invite customers to a special event, you’re building relationships the old-fashioned way–with personal, face-to-face contact,” says Entrepreneur. At the start of the year, company leaders should take time for thoughtful reflection, recognition, resolution, and celebration. In doing so, businesses can foster improved employee and customer relationships, and these relationships are imperative to overall success. So celebrate with a holiday party, send a simple note of recognition, and keep the workplace holiday cheer moving in the New Year. How does your company ring in the New Year?